Our power levelling guide will help you reach level 30 fast in Anthem. It takes some serious power-leveling to get to Anthem’s best stuff. Leveling naturally through the campaign will still drop you off a good 10 levels before level 30, where the endgame kicks in and loot with bespoke stats and characteristics begins to drop. 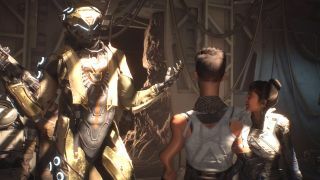 You’ll want to level up quickly in Anthem, because that final sprint to unlocking the Grandmaster difficulties is an arduous one. Since Anthem is finally out now in all forms, save time and psychic energy with our Anthem power-leveling guide. Anthem rewards you for playing with other people by divvying out bonus XP via the alliance system. For every squadmate you finish a mission with, you’ll get a big chunk of extra XP as a reward. As painful as playing with strangers can be, if you want to hit the endgame faster you gotta keep your squad open. To be honest this will be most of the missions in the game. Once you’ve equipped a combo that you can complete solo on your Javelin—and know how to reliably set it off—you can blast through enemies on Hard mode almost as quickly as you can on normal. A couple of the big, crucial story missions will be tougher because of the huge number of enemies the game throws at you, but otherwise don’t be shy about bumping up the difficulty. You will probably find yourself playing with high level players because the endgame requires players to do a lot of Quickplay, which frequently matchmakes them into lower level games for bonus XP. Expedition feats are mini challenges within every mission that grant some bonus XP upon completion. The challenges encourage doing a little of everything, handing out feat XP for reviving teammates, triggering combos, multi-kills, hitting weak points, and more. Just open your inventory during a mission to see the progress you’re making towards each feat. Keep in mind that they reset every mission, so you’ll need to mix things up all the time for that XP bump. If you’re trying to squeeze expedition feats for all they’re worth, hop into freeplay until you’ve done ‘em all, though you’re probably better off trying for feat XP in quickplay. Fill out slim squads and get some bonus XP for bringing them to the finish line. You might enter a mission you’ve already played a couple times and also might show up at the last minute, but the extra XP is worth it, especially if you’ve already finished the critical path. Save quickplay for grinding levels after you’ve finished the campaign and you’ll hit level 30 in a couple hours, long as you’re not playing solo. Once you complete the first batch of normal contracts, legendary contracts will unlock. They’re nothing too special, just difficult contracts with better drops, but you’ll also get more XP for completing them. You’ll know if a legendary contract is available if you see a purple contract icon on the map in Fort Tarsis. Once a legendary contract is completed, just return to quickplay until another appears.